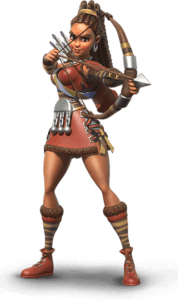 A markswoman, as the name implies, is a woman who is skilled in precision shooting, using accurate projectile weapons to shoot at high-value targets at longer-than-usual ranges. Within the military, markswomen/marksmen are sometimes attached to an infantry fireteam or squad where they support the squad by providing accurate long-range shots at valuable targets as needed, thus extending the effective tactical reach of the fireteam or squad. In the Middle Ages, the first use of the term ‘marksman’ was given to the royal archers, or bowmen, of a palace guard, which was an elite group of troops chosen to guard a royal palace or the royalty.